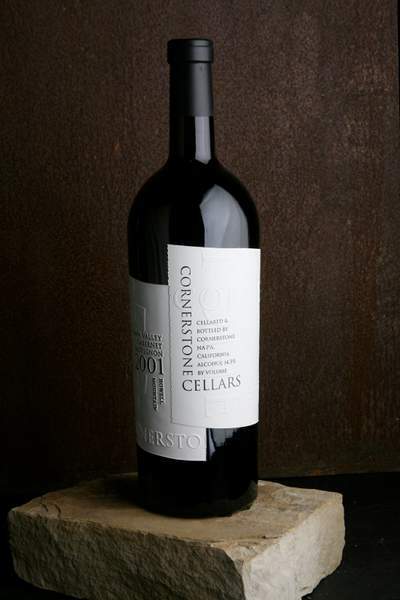 Cornerstone Cellars has generously, incredibly generously, contributed an etched 6.0L bottle of their wonderful 2003 Cornerstone Cellars Howell Mountain Cabernet Sauvignon. Retail value is $1,000.00. This is a single bottle auction lot. This is 100% Cabernet Sauvignon from Ink Grade Vineyard. The imprint of Howell Mountain clearly identifies this wine: intense fruit tempered with savory herbal notes, rich tannins, good acid for aging, and many layers of complexity. Fresh raspberries lead in the nose followed by mocha/chocolate, a subtle nuance of pine needles, mint and herb tea, with an undercurrent of vanilla rounding out the aromas. The entry starts big and blooms with a very rich and full mid-palate. The finish is strong cocoa and caramel with a little more “grip” than the Napa Valley bottling. 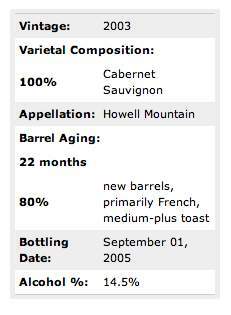 This wine was aged for 22 months in small oak barrels, primarily French, and about 80% new. Opening bid is $500.00. Minimum bid increment $10.00. Gracias, a todas las bodegas que puedan domar un botella para la subasta,invito a mis amigos mexicanos que se unan ala causa. $625. I wanted this one since Craig offered it.